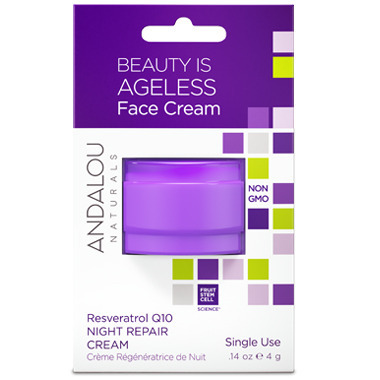 ANDALOU naturals Resveratrol Q10 Night Repair Cream now comes in a convenient single use pod. ANDALOU naturals Fruit Stem Cell Science renews skin at the cellular level, blending nature and knowledge for visible Age Defying results. The Fruit Stem Cell Complex, Resveratrol, and CoQ10 create a potent portfolio of antioxidants to stimulate circulation, slow cellular damage and speed healthy cell renewal for improved dermal texture, diminishing fine lines and wrinkles overnight for smooth, ageless beauty. Gifting -- pass along to a friend so she can try your favourite products! Perfect tester size. Lasted me a few days. Loved the smell! Had one and a half uses - enough to determine if I liked the product. Smelled like cookies (probably the vanilla) but not in a pleasing way, more in an I want to eat my face way. Moisturized fairly well.